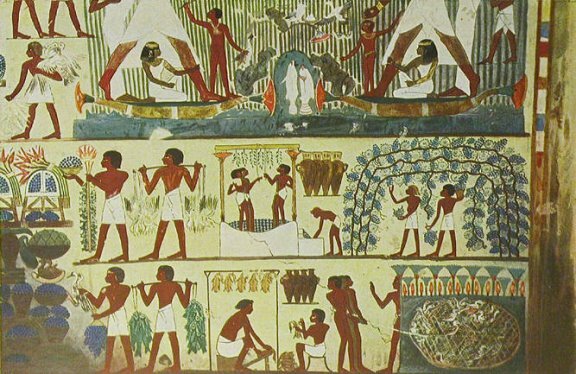 In the top Nekht (a scribe of the granaries at the middle of the 18th dynasty) is seen hunting birds amongst the reeds, into which he has penetrated in his boat. His household are enjoying the sport with him. He is holding in one hand a decoy, and in the other a boomerang. A charming figure of his little daughter is seen as she points to the fish which her father had speared from a boat, and turns her face fondly up to him. Below this, there is the representation of a vineyard and a wine-press. In the last row, are representations of plucking poultry.